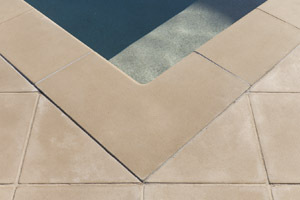 Over the years, Jolly Rogers has built an enviable reputation within the pool and landscaping industries for their premium quality cast stone bullnose coping and paving products — but this is just the tip of the iceberg. 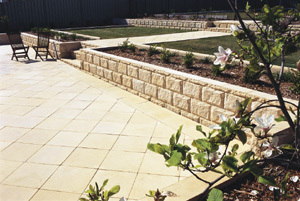 Jolly Rogers offers an extensive range of cast stone landscaping products, each carefully crafted from their unique stone mix. 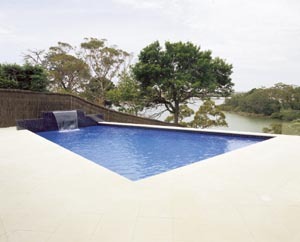 In this backyard renovation, Jolly Rogers’ new Interlocking Rockface Blocks have been used to stunning effect to level out the long sloping site and create three useable areas. 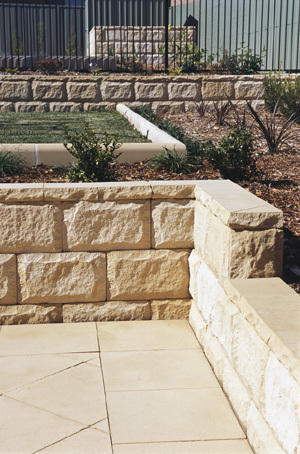 Moulded from natural split-face sandstone for a completely authentic look, all you have to do is dry stack the Rockface blocks to create retaining walls and garden beds. As a means of dividing the expansive area of lawn from the newly established garden beds, the owners of this property chose Jolly Rogers’ Bullnose Kerb Edging. To complement the tall edging pieces and interlocking blocks, they then opted for Jolly Rogers’ 450mm x 450mm x 40mm Rustic Stone Pavers. These pavers have been used to create a path between the different levels and to pave the lower entertainment area near the house. All the products used in this renovation project — the pavers, Rockface step treads, blocks and capping as well as the bullnose kerb edging — were hand-made from the same mix of crushed stone aggregate and highest-grade cement to give a consistent look throughout the whole landscape. As this garden makeover proves, Jolly Rogers’ premium-quality cast-stone products have the kind of classic good looks that make them suitable for both formal and contemporary settings. 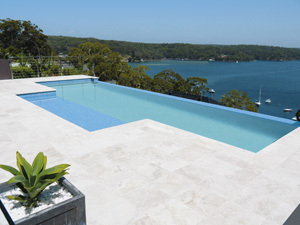 Cool underfoot, salt-safe and slip-resistant, their cast stone is particularly well suited for use around pools and in outdoor entertaining areas. Jolly Rogers can also supply paving and bullnose coping in natural sandstone, limestone, travertine, granite and basalt as well as various stone wall cladding feature tiles, cobbles and pebbles. With a national network of agents, call Jolly Rogers Exclusive Stonecraft when you need a quality stone product for your next landscaping or pool project.